Uses: Charter School, Classroom Partitions, Education Colors: Blue Lengths: 11 panel 20'-5" Heights: 6'-0"
With their focus on providing an excellent education to its students, the Bay Area Technology School is always looking for ways to better use its space to offer more opportunities for the students to learn and grow. 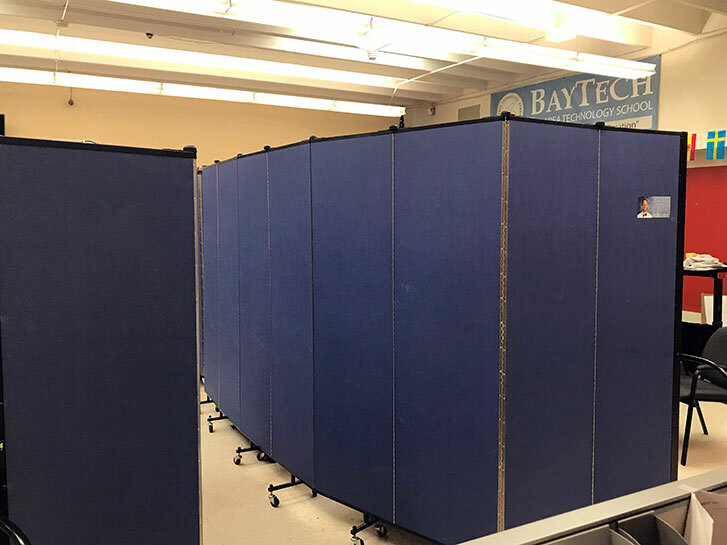 In order to achieve this goal, the school uses portable classroom partitions to divide classrooms, common areas, the cafeteria, and the library to create more intimate classrooms for extensive learning. The blue room dividers match the school colors and serve as bulletin boards within the space as well.